Two weekends ago [I have not been a diligent blogger] we drove to NH for Don and Amy's wedding. Plans were up in the air until the very last minute, but it all worked out. We actually stayed in CT with Adam and Christen. It was the perfect way to break up the drive and a great opportunity to hang out with them. We usually only see them in MA when they visit the Backiels. Amy was a gorgeous bride. It was a perfect day, bright sunny skies and a slight breeze. They couldn't have asked for more. The wedding was amazing. Amy's Dad assisted with the vows and Mr. Humpton prayed for the couple. 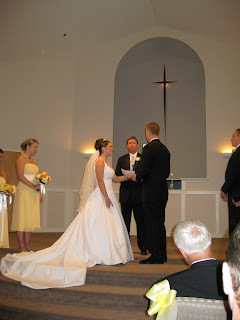 Here is a picture as Don is saying his vows to Amy. 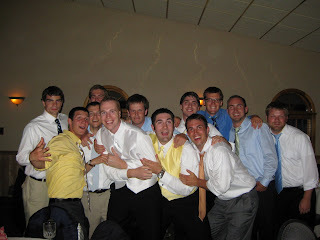 Being a lacrosse wedding, a lot of the guys Mark coached were there and for many of them, this was there first wedding. It was great to see all of the guys again and hear what they have been up to. We miss having them all over for dinner now that we live so far away. Here is a picture of all the guys with Don. As you can see, they had a lot of fun! I have never seen these guys dance so hard. Michael and Ben did the worm, Matt and Dan were going crazy. And Josiah and Don never seemed to leave the dance floor. Every cheese 80s dance move was incorporated from the sprinkler to the shopping cart... As you can imagine, it was hillarious. As Mark and I drove back to CT after the wedding, we couldn't stop laughing about all the fun we had. This is an incredible group of guys. We are so blessed to have been able to attend this wedding, and also to have all of these guys in our life.